The 2019 Dragon Boat Challenge takes place on Sunday 4th August as part of the annual Riverside Festival and is one of the largest and most eagerly anticipated team events in the region. Its also a great fundraiser for the Challenge’s official charity, Rainbows: a hospice providing vital care and support to babies, children and young adults with life-limiting illnesses across the East Midlands. so, by taking part in the Dragon Boat Challenge you and your crew will have the chance to make a difference to over 400 children and their families. Up to 50 crews from all over the East Midlands are expected to battle it out over the 200m race course and East Midlands Business Link are proud to be sponsoring the event, so we’ll be doing our utmost to make sure its a huge success and that all companies entering a team get plenty of well-deserved publicity too. No previous experience is required to take part in the dragon boat challenge, just plenty of team spirit. 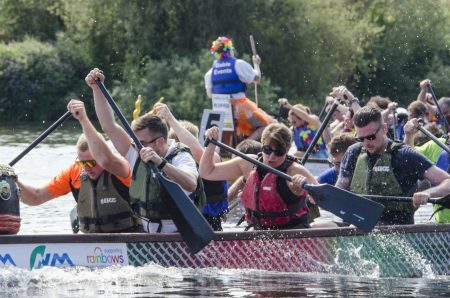 The dragon boats, qualified helms and all racing equipment are provided and each crew is guaranteed a minimum of three races.